BLOG: YTC_Hollyweird: Episode XXV: Behold My Mighty Man-Thing! 2012 saw the release of two comic book Superhero properties released to big effect, both The Avengers (Or ‘Marvels Avengers Assemble!’ if you prefer) and The Dark Knight Rises (Or ‘Fmpf Duhhhr Nhut Rzzzes‘ if you couldn’t understand Bane). Both films made a shed load of money at the Box Office. 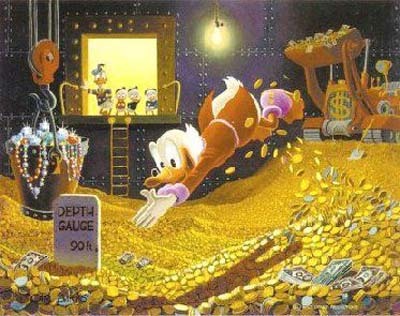 ‘Shed load’ is of course not a technical term, but they were probably both big enough hits to enable the Producers to enjoy a Scrooge McDuck style swim in their profits. Of course Superhero films have been large hits before. Sam Raimi’s take on Spider-Man was such a big earner that less than 5 years between his trilogy the whole franchise was rebooted. Tim Burton’s 1989 version of Batman was a pop-culture phenomenon that reportedly netted Jack Nicholson a total of $84 Million! Men In Black was based on a long-forgotten Malibu imprint comic. 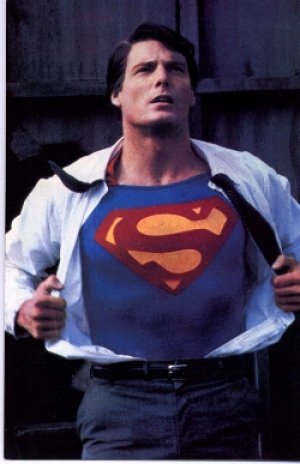 Even 35 years ago, the success of Richard Donner’s Superman is perhaps what first proved comic-book properties could work as Summer blockbusters. There are further success stories too, but then again there are also the flops. Not just financial flops, but critical ones. The sort of films whereby the film makers did not bother to read the source material. The sort of turkeys that even a Vegetarian such as myself would like to shoot down with one of one of Iron Man’s Repulsor Rays. There are a whole gamut of terrible low budget films, TV Movies or Pilots based on Comics properties. Among these productions can be found a Spider-Man in LA who fights ninjas, David Hasslehoff as the least menacing Nick Fury of all time and an Italian Red Skull (I’m guessing the Producer fancied a break in Milan over Berlin). Suffice to say these are notoriously awful and shoddy treatments of valuable properties, and I haven’t even mentioned Roger Corman’s Fantastic 4 movie. (Mind you, if Roger Corman made a film starring Hasslehoff as Spider-Man in the guise of an international Ninja battling Italians I’d certainly give it a go). Some readers may feel that any of the three Punisher movies should be included, or maybe either of the Ghost Rider movies deserve a nod here. Perhaps the camp Batman Forever or Batman & Robin are strange omissions in a list of bad comic book movies. 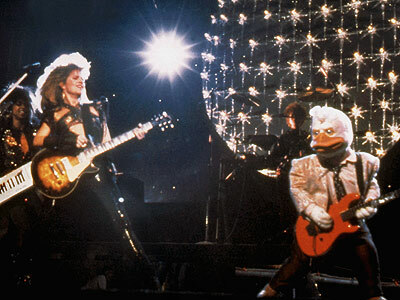 Likewise for Howard the Duck. These are all bad films- truly bad films in some cases- but I feel that they all have some level of redeeming quality about themselves. Yes, really. Not much, I grant you. But certainly I can at least enjoy aspects of any of them with friends or booze or boozy friends. Elektra, Barb Wire or Catwoman have zero entertainment for me though. They are each dumb or dull, and at least two are arguably insulting to Women everywhere. Yet despite all of this, they are not the worst Comic Book movie that I have ever seen. Oh no. For you see I actually own a copy of…. Man-Thing! So just why is Man Thing worse than all of the aforementioned movies? Well, put simply, it has nothing to do with the damn comic! 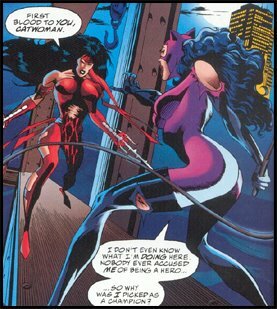 Say what you will about Elektra, Cat Woman or Barb Wire but they at least have some semblance to their source material. Man-Thing is not a well known character by any means. In the publishing world there are two giants in the Superhero print; Marvel’s and DC. Marvel’s most famous creations are quite possibly Spider-Man, The X-Men and The Avengers. Meanwhile DC’s heavy hitters are arguably Batman, Superman and Wonder Woman. One of DC’s characters, Swamp Thing, details a sentient plant-like creature that is charged with protecting ‘The Green’. The Green is not money or marijuana, but it is instead the Earth. Swamp Thing is in effect an conscious vegetable that is a vigilante member of Green Peace. Man-Thing is often considered Marvel’s version of Swamp Thing. (Though both steal from an older character called The Heap, too if you want to get technical). 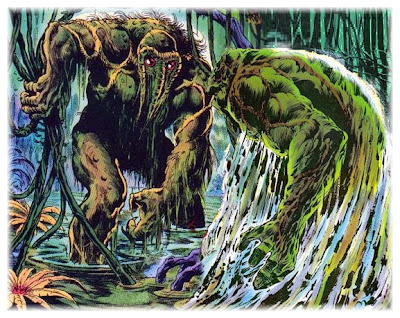 Both Man-Thing and Swamp Thing have similar monikers, they certainly both look alike and both dwell in similar habitats. Depending on which writers is supplying the origin, Swamp Thing and Man-Thing even have similar origins within their respective back stories. However, where as Swamp Thing has a clear purpose within the DC Universe and has at times been written with considerable insight into the human condition, Man-Thing is pretty much a C-List Marvel character. He is more of a silent beast that helps shift stories in certain directions. 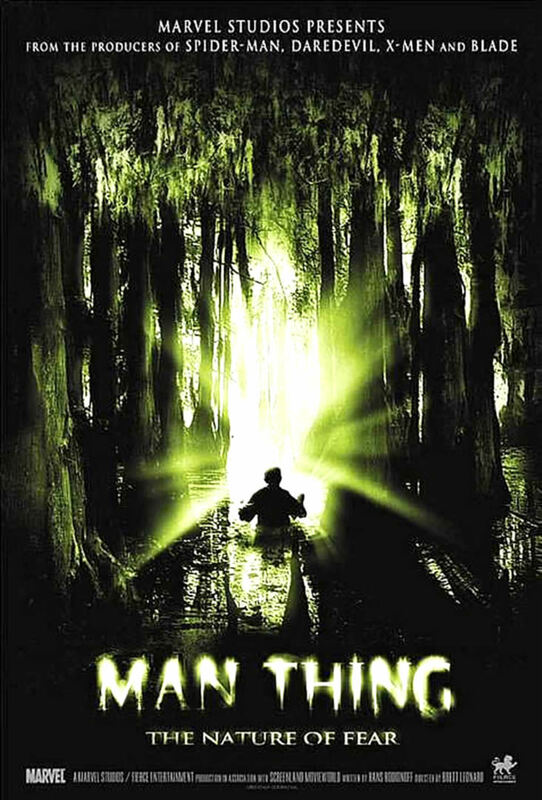 Perhaps the most relevant difference for this blog is where as Swamp Thing’s first movie adaptation was for a Theatrical run and was handled by Wes Craven, the Man-Thing’s movie was shown as a Sc-Fi channel movie and was made by Brett Leonard. Who is Brett Leonard I hear you sigh? Why he’s the director of The Lawnmower Man, Highlander: The Source and Virtuosity. Ah. That explains a lot. Isn’t it funny how Sheriffs and Journalists are always this young and attactive? In the comics, the general idea of Man-Thing is that he is a mutated scientist. He is no longer capable of coherent thought and relies on emotional states. His body is a mix of acid and vegetation. He lives in a swamp, which coincidentally enough is also the ‘Nexus to Other Realities’. 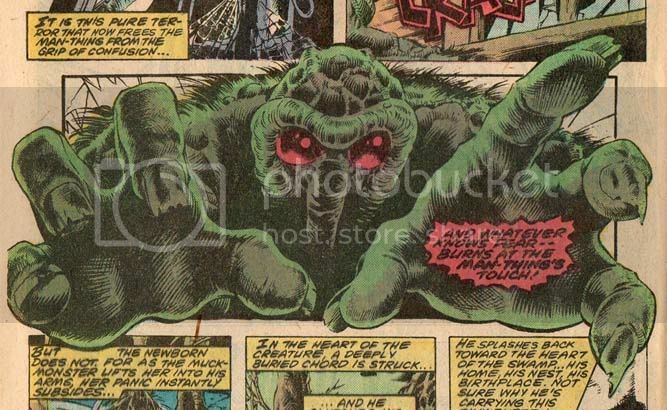 So he just sort of mopes around the swamp, and if any demonic things appear linked to the Nexus, Man-Thing tends to pick up on their evil vibes and react accordingly. He is sort of a good guy by circumstance more than an actual hero. His predominant power is also described in the same way throughout many comic books that I read as child. For you see, “Whatever knows fear…. burns at the Man-Things touch!” I thought that was due to Gonorrhea, but nope. It’s Fear. So for instance, should a human character be in contact with Man-Thing and they are scared, his own emotional state will flux and he will begins to secrete acid. The human will then melt due to their initial fear of him. There is most likely a lesson about not fearing the ugly or the unknown in there, but as a kid I just liked the fact that bad guys touched him and then melted. 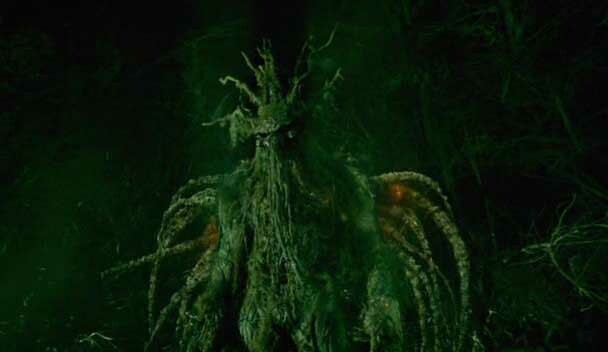 In the 2005 film Man-Thing, the title character is now a Native American monster. It stalks anti-environmentalists and grows trees inside them or, if its feeling particularly uncreative, it simply rips them limb from limb. The film plays like an after-school special mixed with a Slasher film, starring a killer Broccoli Stalk as the villain. So manly… yet so… thingy. I could describe the film further, but I just plain do not want to. It is too depressing to write up much about the film. Instead I’ll just add these random thoughts. Being a film that involves Native Americans there is of course a ‘wise old Indian’. He knows things that the White folks simply don’t. Of course if he openly share these thoughts he could save a lot of lives, but maybe he wants his land back. Being a horror film, there is a girl with fake breasts out the start of the movie. She is supposed to be a teenage school girl, so you have to think that signing off on fake breasts is some bad parenting right there. Throughout the feature there are repeated cut away shots of nature. So many in fact I do not think there is some deep message about environmentalism so much as a need to pad out the total running time. Man-Thing looks surprisingly good. He is a good approximation of his comic image. However the film makers have given him a permanent shake. Whatever the logic of it, ‘Poor Ol’ Manny’ seems to be suffering from Parkinson’s Disease. The end of the film involves the swamp being polluted with Crude Oil. Man-Thing is then dispatched via being set alight. Quite the plan from the good guys. Luckily enough the oil never catches alight or the Swamp would be reduced to cinder. Good thing all Crude Oil is fireproof, right? Right?? 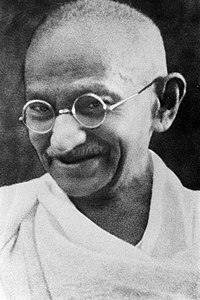 Perhaps this is not the ‘wise old Indian’ you were expecting, you racists?!?!? The oddest thing about Man-Thing is that it even tough is a terribly dull watch, at least it has some sort of a plot which is more than can be said for something like Green Lantern. The truth is that I have seen more inept films many times over. However I still I have to consider it the worst comic book movie that I have seen for one simple reason; the film makers got Man-Thing’s powers and origins wrong. Man-Thing barely has any back story or powers and the film makers still erased them! They had a near open canvas to play with abut still avoided only the loosest of pencil sketches that were already in place. If you get the rights to a Superhero property and then disregard 90% of the very loose back story and the characters powers, then why even bother to use the rights?!? Why not just make the same film and call it “Swamp Beast” or “Ragin’ Cajun”? It’s not as though the name ‘Man-Thing’ has much cache amongst even comic fans. I’m not sure this can count as a wasted opportunity since even a self-confessed comic nerd such as myself was hardly waiting to see a Man-Thing adaptation. It is however a waste of 97 minutes of my life that I will never get back. Now, I have in fact been slightly in-genuine in this entry. There is one film so terrible that it is actually even worse an experience than Man-Thing. A film that stars Scarlett Johanssen dressed in different fetishist costumes and still manages to be a total waste of time. A film that makes me wish Man-Things touch could burn my eyes out. But if anybody out there thinks that I’m going to ever write about The Spirit then they need a slap upside their head. Next Time I have no idea what I’ll be doing. Some physical injuries a while ago have made this blog hard to plan, so I’ll just play it by beer!